I thought it would be good to have a few 'snowy' photos to kick-start the photos category, particularly now that the weather is getting better, as we can look back and go 'ahhhhh', as opposed to thinking about being snowed in, delayed trains, traffic jams, etc. 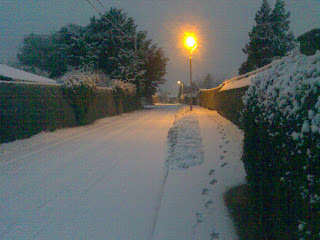 There are some excellent photos of East Malling under snow in the King & Queen pub. A good excuse as any to pop in for a drink! I've attached one I took on my mobile on the Rocks Road on 8th February this year. If you have any others please email them to me (mailto:deanjmason@aol.com.